We know it can be really hard to pick the right supplement for your horse- you want a calmer…but how do you know it’ll help support your horse? You want a balancer to support great condition…but how do you know it’ll do what it says? You want a hoof supplement that supports quality hoof growth…but as hoof growth takes a long time, how do you know you’re not wasting your money? Do you know how? The Equimins money back guarantee! 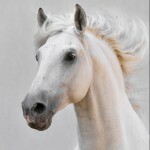 A number of our products come with a money back guarantee – if you don’t see an improvement in your horse, we will refund your money, subject to Ts and Cs. Why do we offer this? We know our products do what we say they will, we want you to be delighted with them, we’re confident – so confident that we’re prepared to give you your money back if you’re not happy. Advance Concentrate Complete– our high specification feed balancer that just needs you to add forage to ensure the horse’s needs are met! If you don’t see an improvement in your horse’s general condition after adding this to your feeding routine for a two month period, we’ll refund your money. 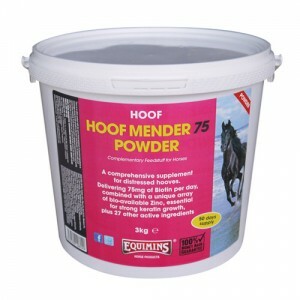 Hoof Mender 75 – our top of the range hoof supplement that combines high levels of biotin with zinc and other key ingredients to support strong, new healthy hoof growth. If you feed your horse Hoof Mender 75 for 12 months and don’t see any improvement in hoof quality, we’ll refund your money. Flexijoint is a powerful joint supplement that supports healthy cartilage, strong joint structure and the quality of the synovial fluid. In the unlikely event that Flexijoint doesn’t work for your horse after adding it to your horse’s feed for two months, we’ll refund your money. Flexijoint Liquid is a powerful joint supplement with a Devil’s Claw base that supports strong joint structure, healthy cartilage and the quality of the synovial fluid. If Flexijoint Liquid doesn’t work for your horse, after adding it to your horse’s feed for two months, we’ll refund your money. Flexijoint Liquid with Bromelain helps to maintain healthy cartilage and joint structure using a combination of glucosamine, chondroitin sulphate, MSM, hyaluronic acid and other important ingredients along with bromelain, a derivative from pineapples. If you don’t think that Flexijoint has worked for your horse after feeding it for two months, we’ll refund your money. Serenity Ultra Calm + is a high specification calming supplement that uses magnesium with very digestible calcium, herbs and other key ingredients to help induce calm without lethargy. If, after feeding this supplement for two months your horse isn’t calmer, we’ll refund your money. 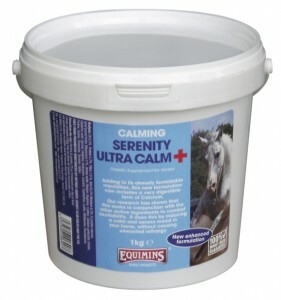 Serenity Liquid Calmer is ideal for those who prefer to add a liquid calming supplement to their horse’s feed. It has an impressive list of ingredients, is excellent value for money and, if it doesn’t work for your horse after two months, we’ll give you your money back! Please note that proof of purchase (relevant receipts) is required to receive a refund.